Why spend more money on gym kit, protein, headphones and tech when you can save serious cash? Below, Men’s Health UK explores some of the very best deals you can cash in on this Black Friday. 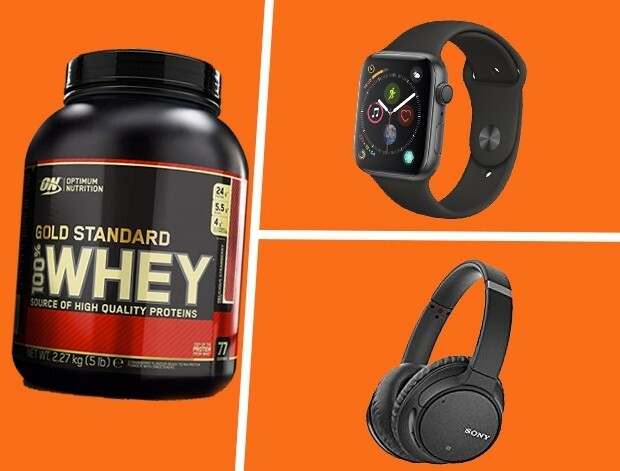 From muscle-building whey protein from the likes of MyProtein, Optimum Nutrition to sweat-tested kit from Nike, Gym Shark and New Balance, there are some serious bargains out there. Likewise, you can grab an Apple Watch, Garmin or Fitbit on the cheap. What’s not to like? Just today, Amazon announced a huge 56% discount on Optimum Nutrition Gold Standard Whey Protein Powder, selling a 2.27kg tub for £36.49, instead of the usual RRP of £82.99. There are fitness trackers and then there are fitness trackers. This is the latter. Although, technically, it’s not just a fitness tracker, it’s really a smartwatch and the world’s most popular watch, period. It comes with all the features you’d expect, so activity tracking, heart rate monitoring, coaching and workouts – it does the lot. As it’s a smartwatch, you can also take calls, send texts and pay for things using Apple pay. Perfect for when you’re plodding the roads preparing for your next marathon and need to purchase a quick pick-me-up. Like the Apple watch, Samsung’s offering also monitors your activity, tracks your heart rate and makes sure you’re getting a good night’s sleep. It also records your stress levels and provides what Samsung calls “intuitive guided breathing” for when you need to recapture your zen. When we reviewed the third iteration of the Fitbit Charge last month, we called it “sturdy, stylish… and certainly smart enough”. While it’s not technically a smartwatch, the Charge 3 does have some features that lean towards that description. For example, the watch uses Fitbit Pay, which allows you to leave your wallet at home. All the fitness features you’d expect from a Fitbit are still there though, so activity and sleep tracking, heart-rate monitoring, workout modes and guided breathing are all nestled within. Features include a heart rate sensor, GPS tracking and a selection of in-built apps that can monitor any activity from running and yoga to snowboarding. On the smartwatch side, the Vivoactive comes complete with a payment system called Garmin Pay as well as sleep and real-time stress tracking. The watch is also capable of giving you an estimated “fitness age”, which may be the bolt you need to also invest in a gym membership this Black Friday. Previous articleWhat’s the Best Time of Day to Exercise for Weight Loss?